Are French Drains Suited To Cold Climates? Flooding is a very common and rightfully dreaded occurrence that homeowners will be keen to avoid. Flooding can cause extensive damage and not only require expensive repairs, but it can also damage or destroy important and sentimental items. Because of this, it is extremely important to find ways of avoiding floods and their subsequent damage. This is particularly important when living in areas where there is commonly a high amount of rainfall. French drains are particularly suitable for residents living in areas where there is a significant amount of rainfall. They are also recommended for those living in low-lying areas that might be prone to potential flooding complications. French drains provide an effective means of keeping both groundwater and rainfall from entering your residence or business. This can also be extremely important if you live in a damp area. Areas near swamps and bogs, or even areas located near lakes, streams, creeks and oceans can benefit from French drains. 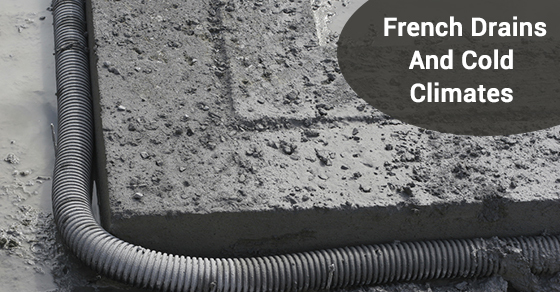 Any building located in an area that has some likelihood of developing or accumulating groundwater will benefit from a French drainage system. Preparing in advance for such circumstances can greatly reduce the hassle and potential damage of an actual flood. French drains are commonly employed to move groundwater from one spot to another. The goal is to divert this groundwater from finding its way into a business or residence. French drains are commonly built as a perforated pipe that comes out of the ground and moves the water as desired. They might also be built as trenches filled with rocks and perhaps gravel. The overall point is to provide a pathway for the water to travel through to its designated location. Are French Drains Appropriate For Cold Climates? French drains are definitely appropriate for cold climates. However, there are pitfalls that need to be avoided to ensure that they function as they should in more trying climates. This often involves placing the French drain below the frost line. This takes more effort, but is absolutely critical for ensuring year-round performance. When placed below the frost line, your French drain will work in all seasons and will not suffer from issues such as frozen obstructions caused by either the freezing or thawing cycles. If you are in need of French drain services, consider Brothers Plumbing, a leader in the industry. Not only do we have over 50 years of experience in plumbing and heating, but we also offer very affordable rates and offer our services seven days a week. Contact Brothers Plumbing today.